Features Baba Brinkman, the world's first and only "peer-reviewed rapper"
Baba Brinkman in Rap Guide to Consciousness. BOTTOM LINE: Drama Desk Award-winner Baba Brinkman is the nasty neuropsychology guru you wish you'd studied with in college, teaching you more with a rap than you'd ever learn in a textbook. For most audiences, an evening out at the theatre serves a common purpose: to help us get out of our own heads for an hour or two, and instead focus on the plights and follies of a cast of fictional characters. Baba Brinkman was seemingly placed on this earth to prevent you from doing that. In his 70-minute Rap Guide to Consciousness, Brinkman tackles the ins and outs of understanding the modern psyche, why we perceive things as we do, and what it means to be conscious, truly alive, and capable of bearing witness to the "human" experience. As intellectually stimulating as a rapped TED Talk, Brinkman spits rhymes about Bayes' Theory, artificial intelligence, and the blissful ignorance that his newly-conscious son must be experiencing. Brinkman is smart. His wife is a neuroscientist. He is, he says, the world's only peer reviewed rapper. He has written countless "rap guides" that break down the big topics, making things like religion, climate chaos, survival in the wilderness, and The Canterbury Tales as comprehensible as SparkNotes. The content and theories presented do, in themselves, make Rap Guide worth seeing; however, the artistry of the show also deserves to be highlighted. Brinkman plants interactive experiments throughout his songs, asking the audience yes or no questions and "grading" the room on their understanding of a concept. 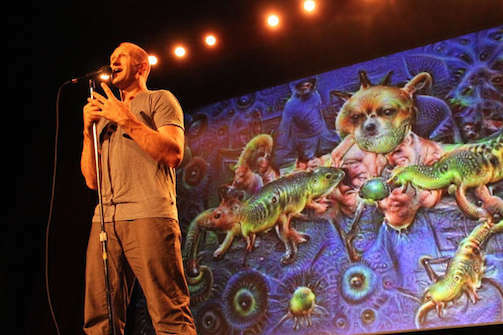 While most of the audience is not comprised of neuroscientists (although the few present in the house do make themselves quickly known), the expert projection design by Olivia Sebesky and Don Cieslik complements Brinkman's rhymes with graphics that help anyone feel like a psychology whiz. Brinkman's raps are undeniably inspired by hip hop greats like De La Soul, A Tribe Called Quest, Nas, and Busta Rhymes. He loves to poke fun at himself, though, acknowledging that he's a hardly a typical example of a rap artist. He plays a game with the audience: "Think of a white male rapper," he asks. The entire room thinks of Eminem. "Think of a Canadian rapper," he asks next. We all think of Drake. "Think of a middle class rapper," he asks a silent room, until we finally hear a mention of the up-and-coming comedic rapper, Little Dicky. "Now someone who raps about science?" To the hushed room, he asks us why we don't think of someone like him. In doing so, he identifies a pattern weakness in our own neurons. We don't expect the same person who teaches us Elon Musk-level theories of reality to be the same person who makes us bob our heads while they freestyle with expert syncopation. Rap Guide to Consciousness is a delight for the intellectual. Rap Guide to Consciousness is a delight for the rap junkie. Rap Guide to Consciousnessis a delight for stoners and for STEM fielders (as they are not exclusive). Brinkman and his creative team understand the complexities of their audience, and the desire we all share in wanting to better understand the brain and body we're lumped with. By all means, attend any of Brinkman's Rap Guides and broaden your outlook—without picking up a book. Rap Guide to Consciousness is written and performed by Baba Brinkman. Directed by Darren Lee Cole. Projection Design by Olivia Sebesky. Associate Projection Design by Don Cieslik. Music by Tom Caruana and Dan Moross. Scientific Advisors are Dr. Anil Seth and Dr. Heather Berlin.